I have to say that my favorite trend from above is the big return of leather. Each year we can easily find few leather jackets but this season it is everywhere: leather pants, skirts, dresses, t-shirts; yes I said leather t-shirts. That last item is a good example of what is new this season. We can easily find leather in items that usually are not made of this material . The second new thing concerning leather is the fact that it is mixed with other materials such as cotton, silk, wool, velvet.. 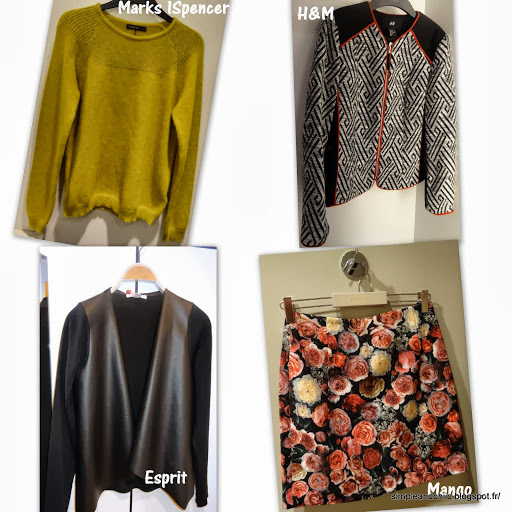 The above cardigan from Esprit (mix of leather/cotton) is a really good example. Now let’s talk about THE HUGE trend of the season: the denim shirt. Like leather, jeans are back this season. Of course it seems like it is always here because we always wear a pair of jeans;but this season you can find this fabric everywhere. 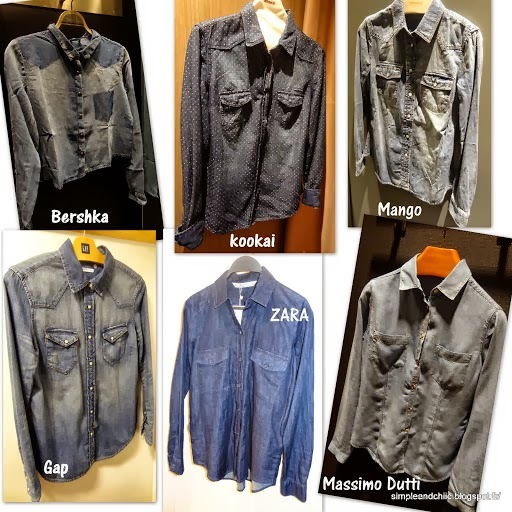 You can choose between denim dresses, skirts, shorts, jackets; but what is the most omnipresent in stores is definetly the denim shirt. I could have taken more pictures because in every single store I was able to find at least 3 different type of denim shirt; some more original than others. I have never had a denim shirt and I don’t really like jeans in general but I tried a few of them to write this post and I was surprise to see how good it fits me. So I may go back to the mall soon to get one. As I said many times on my previous fashion posts jeans fit every material and color and yes you can also pair jeans top with jeans bottom. The only rule in that case is to wear a dark top with a light bottom and vice versa. There are many trends I love this season but I have to say that my two favorites are the "tapestry inspired" and the "denim shirt" so don't be surprise if you see me wearing one of those item in a future "outfit of the day" post !